During the 2016-17 season, Michaud played for both the Carabins and Sporting Outlaws at the same time, leaving him with a scheduling conflict. With two provincial titles to play for, Michaud had to choose between playing for the Carabins or Sporting Outlaws. Friday night’s game for futsal was in Trois-Rivières, and Michaud wouldn’t have been able to travel with the Carabins for their match against the Université Laval Rouge et Or in Quebec City. “I didn’t know really what to do,” said Michaud. He spoke with Carabins head coach Pat Raimondo about his situation. He said that, “He had to go play futsal,” because it’s his team. Raimondo and Michaud came to a compromise. “My coach is tough but he’s a human also, and he understood my position and we found a way for me to do both,” said Michaud. Shaquille Michaud carried a lot of what he learned with the Carabins to Sporting Montreal. As a result Michaud would miss the futsal final game with Sporting Outlaws. But, with tears in his eyes, he would watch his teammates become champions over his phone. It was a decorated weekend for Michaud, but it also made him realize something. Michaud’s decision to cut his Carabins career short was made based on his role. 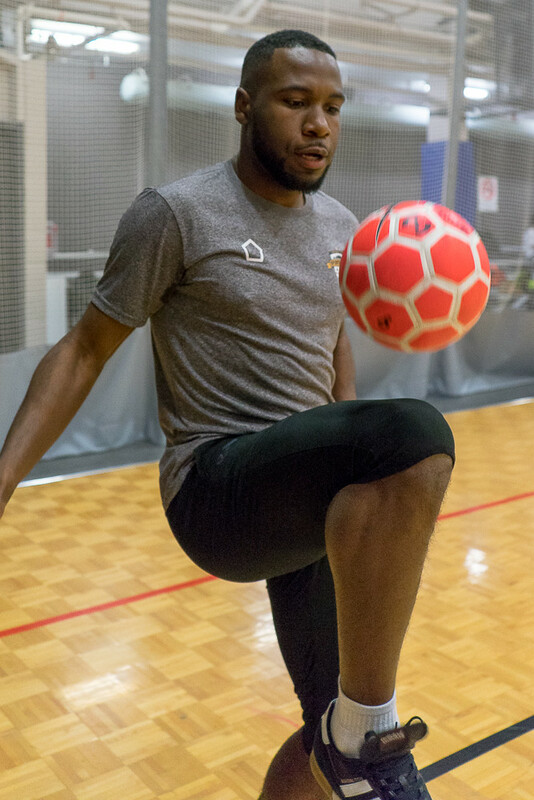 With the Carabins, it was his first year on the team and he wasn’t as high up the pecking order compared to that of the futsal team he captains and wants to help grow. Sporting Outlaws’ success played into his decision too. 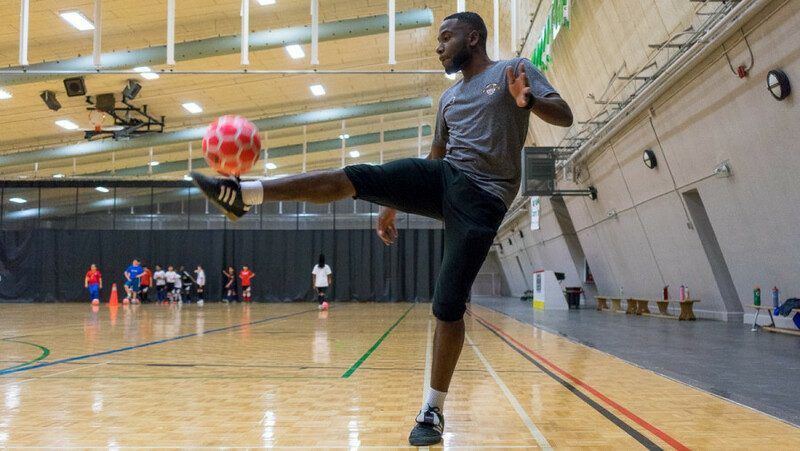 From becoming provincial champions, to being the first team from Quebec to win a national title at the Futsal Canadian Championships, Michaud and Sporting Outlaws Montreal were prospering. Raimondo and Michaud spoke about leaving the Carabins in order to continue ensuring the growth of Sporting Outlaws. The head coach said they had “no problem” releasing him. Since winning the national title, Sporting’s credibility began to grow. The team’s co-founders Marouane Lamnidi and Alexander Fuentes, who is also a goalkeeper on the team, along with Michaud saw an opportunity to further expand Sporting. They rebranded the team name from Outlaws to Sporting Montreal and changed their logo. With the the club moving forward, creating Sporting Montreal Junior, a U-15 girls team as well as a separate Première ligue de futsal du Québec team in Quebec City called Sporting Quebec, Michaud not only decided to retire from the Carabins, but take a break from school altogether. The values that represent Sporting Montreal stem from the lessons Michaud was taught during his time with the Carabins. He highlighted the values Raimondo instilled within the Carabins’ soccer program, which Michaud eventually carried over to his futsal club. Something Raimondo often told his team was that “le bon attire le bon, et le mauvais attire le mauvais”—the good attracts the good, and the bad attracts the bad. “The success that we had with Sporting, it was because we were really humble [and] we worked really hard,” said Michaud. Raimondo pointed to four values that he instills in his players: To be coachable, to be warriors, to be a good teammate, on and off the field, and for his team to embody that when representing the Carabins. Michaud credits his success to his grandmother Gladys Cherestant-Michaud and his uncle Gérald Michaud. 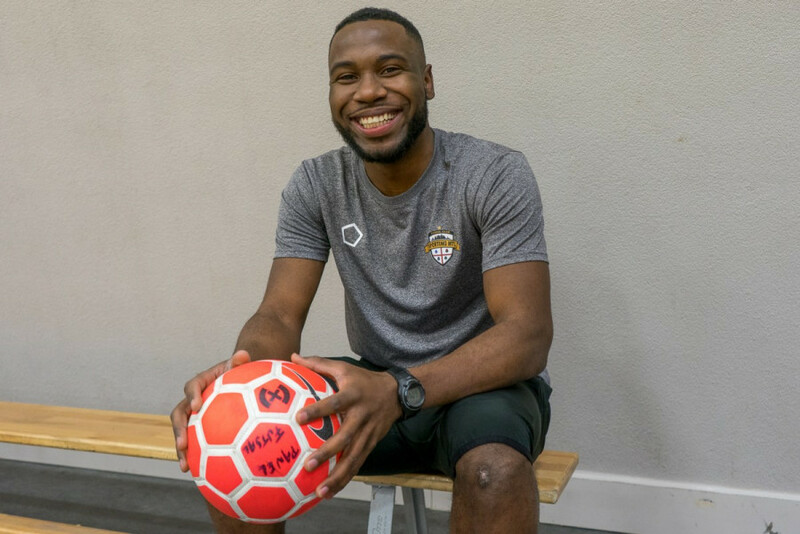 In a past game against FC Sparte, one of the top futsal teams in Canada, in a five-a-side tournament, Michaud remembered his team going back to the locker room down by two goals. In the locker room, Michaud and Sporting’s coach at the time, Lamnidi, led a “passionate” halftime discussion. Along with the lessons he learned with the Carabins, Michaud’s natural leadership has been vital to the team’s success. Being a captain is something Michaud has always been used to. His style of play is vocal and it’s through his performances on the field that he expresses his willingness to step up when his team needs him. His positive personality resonates around the team. “When [Michaud] is in a good mood, everybody is in a good mood,” said Fuentes. As Fuentes dove to make a save, he palmed away an opposition shot from making its way to the back of Sporting Montreal’s net. Fuentes went down. Clutching his back he pounded the ground, his eyes shut and his face glued to the floor. The pain was evident in his grimace. Michaud made his way from the bench. He and his teammate, who was also his close friend of 10 years, exchanged words, before Fuentes was able to pick himself up. Michaud wrapped his arms around him, consoling him after his injury. That was the boost that Fuentes needed to finish the game. His joyous personality and positive presence weren’t attributes that naturally transcended upon Michaud. The characteristics that defined him were taught to him by his uncle Gérald Michaud and his grandmother, Gladys Cherestant-Michaud. Michaud’s uncle was a mentor to him. Shaquille followed Gérald everywhere. Anything his uncle was doing, Shaquille would follow. “He made me realize the importance of honesty and hard work in life,” said Shaquille. match winning goal in that March game against the Grenadiers was a solo effort, and one that showed his determination. Facing the attacking player he pressured the opposition, stealing the ball away. Taking a few touches, he fakes the shot, sliding the ball to his right before placing it in the back of the goal. Running towards the boards, Michaud yells in celebration, slapping the Sporting Montreal crest on his chest. Shaquille dedicates the success he’s achieved to his grandmother. Everything he does is to make her proud, he said. It’s through his success that he wants to let her know, it was not for nothing. Michaud wants to continue to carry on his uncle’s and grandmother’s influence. He believes in their message, one he looks to share. Years down the line, Shaquille, Lamnidi, and Fuentes want to see Sporting’s legacy remain, and to continue growing as a club. With the junior teams, and plans of further expansion, Michaud said that eventually they want to have at least one team in each age category of the league. In a previous version of this article it was written that Franck Mouiche was the coach during a match versus FC Sparte when it was Marouane Lamnidi at the time. The Link regrets the error.